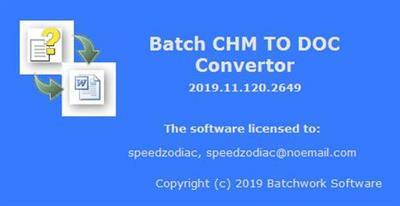 Batch CHM to DOC Converter 2019.11.120.2649 | Free eBooks Download - EBOOKEE! Batch CHM TO DOC Converter is a CHM to Word Document Batch Converter that can convert HTML Help to Word DOC and DOCX easily. Batch CHM TO DOC Converter supports powerful search for a lot of files. A Compressed HTML Help converter for Windows. Batch CHM TO DOC Converter supports project and command line. Batch CHM TO DOC Converter has a friendly GUI so it is used very easily. Batch CHM TO Word DOC Converter Drag and Explorer Context supported. Batch CHM TO DOC Converter supports an efficient Multi-Thread conversion engine. So you could control the conversion action very easily. You can stop or pause and continue it in any time. Convert Compiled HTML Help (CHM) to Word DOC easily. Batch convert CHM to DOC with GUI that supports powerful search function. Supports convert a chm file. Supports convert chm helps in a folder. No comments for "Batch CHM to DOC Converter 2019.11.120.2649".